BANGI, 17 Dec. 2010 – The Prime Minister’s wife, Datin Seri Paduka Rosmah Mansor, has expressed the hope that The National PERMATApintar Programme will produce gifted and talented students who could be a future Nobel prize winner. She hoped the programme would produce successful students with the knowledge and expertise to enhance the good name of the country. “It would thus not be far fetched to expect that there could be from among the many talented and gifted students who are here today who would one day be a recipient of the Nobel Award. God willing,” she said when closing the PERMATApintar National School Holidays Camp 2010 programme here today. She was elated that, five students from last year’s programme who also attended the 2010 Summer Camp of John Hopkins University, United States had done well in their chosen fields of Engineering, Biotechnology, Zoology and Linear Algebra. One of the students, Mohd Asraf Burhani, from Sekolah Menengah Agama Al-Maarif, Kuantan, Pahang, was adjudged the best student in engineering. She also said that the programme was being expanded to include one for the Upper Secondary School for students in form 4. Close to 350 students were short-listed to participate in a Special Math and Science Camp to identify those worthy of selection. 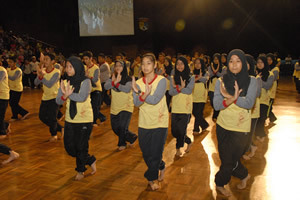 While the students would be following the national curriculum for their SPM, they would also be offered international curriculum, including the American Scholarstic Aptitude Test (SAT), ‘O’ and ‘A’ Level’s and Advance Placement and even a few first year courses of Science and Technology Faculty of UKM. They would also be required to take up two foreign languages in addition to co-curricular activities such as music, sports and arts as well as uniform services and club activities to help build their self esteem and produce multi-talented and multi-skilled Malaysians. Other than selecting gifted teachers, UKM had also invited a few professionals from US and Australia to assist with the programme. Datin Paduka Seri Rosmah was pleased with the progress of the holiday camp for students, even though it had only been operational for a short period of time. This year eight international students from Brunei Darussalam, India and Singapore were included in the programme. That had given the children the opportunity to interact and understand other cultures and traditions. Several new courses like Crystal and Polymer, Mathematics and Game Theory, Flights Science courses have also been included making up a total of 13 courses offered altogether. In addition Green Technology and Advanced Robotic course developed by UKM researchers and scholars was also included. Further improvements to the programme saw the students being exposed to other activities such as public speaking or spontaneous speech, team work, artistic as well as sports activities to ensure a well balanced development for children. Meanwhile, Vice Chancellor of Universiti Kebangsaan Malaysia, Prof Tan Sri Dato’ Dr. Sharifah Hapsah Syed Hasan Shahabudin expressed confidence that the PERMATApintar Programme has the potential to become an iconic brand the nation can be proud of. The programme should be supported by all including the private sector as the students are their potential talents. “This is important as two thirds of the students in the programme are from rural areas and lower socio-economic groups,” she said. Prof Sharifah stressed that UKM experts had shown a strong commitment by developing new modules to challenge the gifted students in the programme. “In this way one day Malaysia, through UKM, would become a consulting and reference centre for other countries which are interested in developing their own centres for the gifted and talented, “ she added. In fact, the centre has attracted attention from individuals from within the country and also from foreign countries such as Korea, Japan, Yemen, Kuwait and Saudi Arabia who visited the centre. The first phase of the National PERMATApintar Complex is now completed, and preparations are underway to enable the first intake of students who will register for upper secondary school programme in January 2011. They will be following a programme designed specifically for the gifted and talented students. 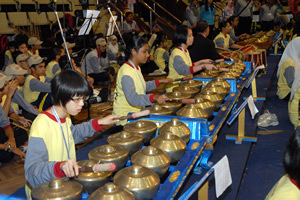 This programme, the only one of its kind in Malaysia, was approved by the UKM Senate in September 2010. Prof Sharifah was satisfied with the design of the curriculum which is aimed at holistic development of the students in line with the spirit of 1Malaysia, National Education Policy and the Educational Philosophy of UKM, and having high global competency. “These gifted children can one day be scholars who can help change the world in a positive manner,” she said.